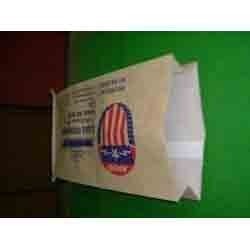 We are a leading Manufacturer of pp laminated kraft paper bag with centre seal from Mumbai, India. We manufacture PP Laminated Kraft Paper Bag by using pp through extrusion lamination. These bags are sealed at one side to form a bag. The bottom is either folded & stitched or stitched with crepe paper. These are ideal for packing products which are to be handled manually & excellent replacement for PP / HDPE woven sacks. We can provide with Good paper quality in Brown as well as white paper. We can do the printing as per the art work with side gusset.